The department was established in 2005. Biomedical Engineering is the application of Engineering principles and design concepts to medicine and biology. This field seeks to bridge the gap between Engineering and Medicine. It combines the design and problem solving skills of engineering with medical and biological sciences to improve healthcare diagnosis, monitoring and therapy. The Biomedical area represents at most dynamic and leading research field and areas of innovation. It has a huge existing and emerging industrial base. The Biomedical Engineering, one of the most fascinating fields in medical has a great future as it combines the knowledge of sophisticated technology with the biology of mankind in order to solve the physiological problems of human beings. Emergence of advanced learning, research and training to strengthen technologies in biomedical engineering for human welfare and Nation needs. M1: To engage with the specific to generic community for knowledge dissemination and career development. M2: To update, analyze and impel the knowledge in the multi-disciplinary fields to strengthen technologies in biomedical engineering. M3: To encourage the students to be aware of engineering principles in medicine for welfare of society. M4: To expertise the students both in engineering and technical fields related to competitive medical technology in research and continuing education. PEO 1: The graduates of the programme will have ability to improve the technologies by combining the design and problem solving skills for enhancing health care products. PEO 2: Graduates of the programme will function as productive team member and leader who act as bridge between engineering and biology. PEO 3: Graduates will be outstanding professionals by enhancing their advanced learning techniques in the field of biomedical engineering to face the global challenges. PEO 4: Nurture responsible engineers with ethical values to serve the society and to learn and excel in higher education. PSO1: Bio- Analysis. Apply mathematical analysis for human paradigm, to problems, thereby to interface engineering and life science. PSO2: Data Interpretation and Problem Solving. Make measurements on and interpret data from physiological systems and decipher the problems associated with the interaction between living and nonliving materials and systems. Bioengineering or Biomedical / Biomedical Instrumentation Engineering involves developing new devices and procedures that solve medical and health-related problems by combining their recent advances knowledge in engineering, biology, and medicine to improves human health through cross-disciplinary activities that integrate the engineering sciences with the biomedical sciences and clinical practice. Biomedical engineers may spend their days designing electrical circuits and computer software for medical instrumentation. These instruments may range from large imaging systems such as conventional x-ray, computerized tomography and magnetic resonance imaging, to small implantable devices, such as pacemakers, cochlear implants, drug infusion pumps and some of the Prominent biomedical applications include the development of various diagnostic and therapeutic medical devices ranging from common imaging equipment such as MRIs and EEGs, regenerative tissue growth, pharmaceutical drugs and therapeutic biologicals. An evolutionary product is a new model of an existing product that adds new features, improves the technology, and reduces the cost of production. Recent progress of the Nano fibrous structure of chitosan and their biomedical applications in tissue engineering; drug delivery, wound dressing, and antimicrobial are also discussed in this review. Biochemistry is the branch of science that explores the chemical processes within and related to living organisms. 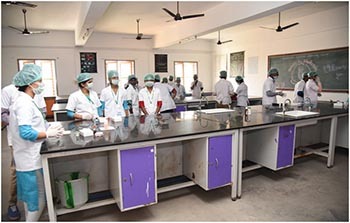 It is a laboratory based science that brings together biology and chemistry. By using chemical knowledge and techniques, biochemists can understand and solve biological problems. Biochemistry focuses on processes happening at a molecular level. It focuses on what’s happening inside our cells, studying components like proteins, lipids and organelles. It also looks at how cells communicate with each other, for example during growth or fighting illness. Biochemists need to understand how the structure of a molecule relates to its function, allowing them to predict how molecules will interact. Biochemistry covers a range of scientific disciplines, including genetics, microbiology, forensics, plant science and medicine. Because of its breadth, biochemistry is very important and advances in this field of science over the past 100 years have been staggering. It’s a very exciting time to be part of this fascinating area of study. Erlenmeyer flasks, AKA conical flasks. Florence flasks, AKA boiling flasks. Test tubes, tongs, and racks. Pathology is a medical specialty that determines the cause and nature of diseases by examining and testing body tissues (from biopsies and pap smears, for example) and bodily fluids (from samples including blood and urine). The results from these pathology tests help doctors diagnose and treat patients correctly. Microbiology includes culturing of clinical specimens, including feces, urine, blood, sputum, cerebrospinal fluid, and synovial fluid, as well as possible infected tissue. The work here is mainly concerned with cultures, to look for suspected pathogens which, if found, are further identified based on biochemical tests. Hot Air Oven for Sterilization: It is used for sterilization of glassware's, such as test tubes, pipettes and Petri dishes. Training programs for hospital work, such as surgical or medical technology or phlebotomy, are offered through hospitals and colleges. Some schools offer the classroom portion of these programs online, and work with cooperating hospitals or healthcare facilities to provide the clinical or practicum coursework. National Level Technical Symposium "CADENZA"